If you suffer from allergies or want to prevent mold growth in your home, a dehumidifier is an essential appliance. They're not without drawbacks, however. Carefully select the model that best suits the environment in which you will place it. You may be surprised at how much more comfortable your home feels once you've removed excess moisture from the air. 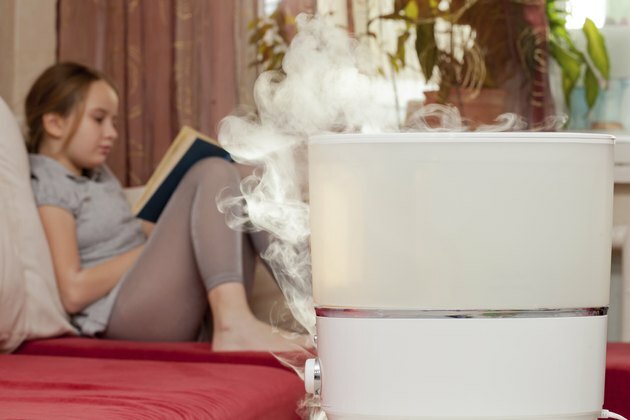 Humidifier emitting steam in a child's room. Excess moisture in the air promotes mold growth, and mold causes allergies in many people. Individuals who suffer from dust allergies can also benefit from an environment that is lower in humidity, as dust mites, the reason for dust allergies, need a minimum of 70 percent relative humidity to thrive. Running a dehumidifier can reduce the relative humidity in your home to 50 percent or lower. Eliminating problems with dust mites and mold in your home may result in better health and less reliance on allergy medications. If you had to choose between being in a room that was 80 degrees and 90 percent humidity or a room that was 80 degrees and 40 percent humidity, chances are you'd choose the latter. Low humidity can help you to feel more comfortable, even when temperatures are high, as sweat evaporates more easily from your body. You may be comfortable keeping your thermostat a few degrees higher in the summer, which can save you money on your energy bill. A dehumidifier can be surprisingly loud. This isn't usually a problem if the dehumidifier is located in a basement, but if you plan to place it in a family room or bedroom, select a model that advertises itself as being quiet enough for those environments. Dehumidifiers also tend to blow warm air out of the back of the unit. In the winter, this can be an advantage -- but not so much in the summer. Position the back of your dehumidifier in a doorway so that it doesn't heat up the room from which you are removing excess moisture. Monthly energy costs can be over $50, although an increase of $15 to $35 is more typical. Fortunately, you are likely to only incur these additional electricity costs during the summer, unless you live in an area that is warm year-round, such as South Florida. You can reduce the amount you spend to run the dehumidifier by purchasing an Energy Star model that is built for efficiency. Dehumidifiers collect water in a storage tank that must be routinely emptied and cleaned -- as often as once daily during damp weather conditions. Some models also feature a removable air filter that must be cleaned monthly. On many dehumidifiers, you can reduce your maintenance requirements by installing a drain hose that empties collected water into a floor-level drain.